I‘ve written about the significance of recurring dreams before and how they are typically attempting to show you something that you’ve been repressing. You can use Jungian dream symbolism to get quite a bit of meaning out of your dream. To address your question immediately – is the dream a warning to keep it suppressed? No. Mostly because suppressing things is counter-productive. The mind suppresses traumatic memories as a way of temporarily shielding us, but long term suppression can lead to all kinds of issues both emotional and physical, hence your PTSD. To see or dream that you are in a labyrinth indicates your desires to get to the center of some issue or problem. Alternatively, it suggests that you are feeling trapped in some situation. You feel lost and that there is no way out. To dream that you are in a maze denotes that you need to deal with a waking task on a more direct level. You are making the situation harder than it really is. There are a few very obvious clues which, as you already know, suggest it’s related to childhood (the Gameboy association with 8bit and the kindergarten teacher). I think it’s interesting that you say the maze is vertical – like climbing out of a well or a cave? Basements, wells, caves, and other things that are “below” represent the subconscious mind. You’re running away from whatever is in there. And the thing that is chasing you is water. Water doesn’t just represent consciousness, it represents emotions and the state of the water can give you a good indication of what kind. For example, a clear, peaceful stream represents a clear, peaceful mind. A tidal wave represents overwhelming emotions. Muddy water can represent icky emotions, a violent, tossing ocean can represent rage, etc. To see your teacher (past or present) in your dream suggests that you are seeking some advice, guidance, or knowledge. You are heading into a new path in life and are ready to learn by example or from a past experience. Consider your own personal experiences with that particular teacher. What subject was taught? The teacher in question was able to breathe under water – water which represents your repressed emotions. This tells me the teacher represents the ability to become fully immersed in those emotions and not only survive, but learn from them, understand them and move forward instead of running from them. When you go under water, more or less, is when you start to get bits and pieces of the memories, so those are obviously what’s being repressed. I think you should consider seeking out a therapist who specializes in recovered memory therapy. Someone with experience in hypnotic regression can be helpful. They should also be trained in treating emotional trauma and PTSD. There’s tons of trauma release techniques that a lot of therapists are starting to use with their clients now. I don’t think I have to tell you that it won’t be easy, but if you find someone that you like and you trust, they can absolutely help you through it. You can also supplement therapy with some serious energy healing and chakra cleansing and start learning some meditation techniques to help you with it on a daily basis and it will help ease the process quite a bit. Just start looking for healing techniques that are specifically for trauma release. If you’re interested in getting further direction from this dream, I can do a tarot reading specifically in conjunction with your dream and the symbolism there to get a clearer picture of what this dream is attempting to show you and how it relates to larger life themes and lessons. Follow the call to action below. Fellow reader, I found a really great book that may be of interest to you: The Body Keeps the Score by Bessel van der Kolk. It’s an amazing book, although it can be a bit dense through the science/brain chapters. I hope you find clarity and peace soon. I believe we are each gifted with the ability to find our own inner guidance – including YOU! 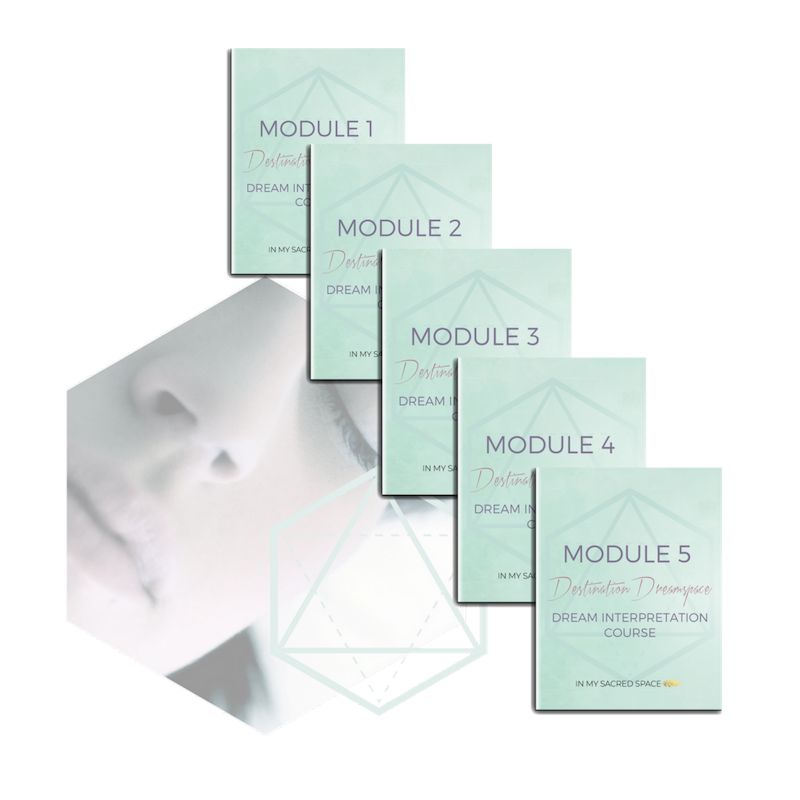 I created this 5 week eCourse to help you find the answers you’re looking for within yourself, using the gateway to your own subconscious – your dreams! In this online dream interpretation course, I’ll guide you through everything you need to know about the dream world and how to analyze your dreams. PLUS, YOU’LL GET ACCESS TO MY TIPS, TACTICS AND STRATEGIES TO DECODING YOUR HIGHER SELF’S SECRET MESSAGES LEFT FOR YOU WHILE YOU SLEEP.